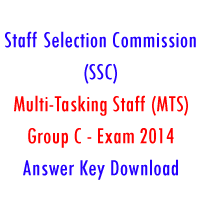 Download SSC MTS Answer Key 2014 – Staff Selection Commission has successfully conducted SSC MTS (Multi Tasking Staff) 2014 Examination throughout India on 23.02.2014. MTS examination was conducted in two stages – first stage examination was conducted on 16.02.2014 and the second stage of said examination was conducted on 23.02.2014. On the basis of Recruitment Notification issued Staff Selection Commission Head Quarter (ssc.nic.in) all nine SSC Regions have conducted SSC MTS Examination 2014. A very large number of candidates appeared for SSC MTS exam. All those candidates are eagerly waiting to check their answers. SSC MTS answer keys will be released in the official website http://ssc.nic.in/SSC.html soon. Download SSC MTS Answer Key 2014 (Tentative) for SSC MTS Exam Morning Session on 16.02.2014..